The commercial real estate tech industry has launched incredible innovations that changed how CRE professionals conduct their everyday business. All year we’ve explored how technology is saving money, streamlining efficiency, and improving the client experience. We’re excited that the tech revolution is continuing to push and break down industry barriers. These are the CRE tech trends we’re watching in 2017. Expect to hear more about blockchain during 2017. The Bitcoin-inspired technology has the potential to speed up the closing process while cutting costs for the consumer. Blockchain’s increased security reduces real estate fraud. Cook County is the first to experiment with blockchain through its Deeds and Recorders Office, and Sweden is applying blockchain in its land registry practices. Keep on eye on future developments and its implications for real estate. Cities are looking at new ways to improve their efficiency and boost their environmental impact using smart city technology. For instance Pittsburgh is looking at smarter street lights that use sensors and machine learning to improve traffic flow and reduce emissions. AT&T partnered with Deliotte this year to work on smart city technology adoption and development. Expect to hear more discussion of smart city technology in 2017. Brokers have been talking about and experimenting with virtual reality for a little while now. Primarily used for high-end properties and commercial developments, its incorporation across the industry will continue growing thanks to more affordable technology. Augmented reality could be the next phase in residential and commercial real estate 360 experiences. AR collaborations could reduce errors in construction and design or enhance a property tour experience. The Internet of Things is improving the efficiency and value of building control operations. For commercial real estate, the IoT means using smart sensors monitoring everything from room occupancy to the humidity. IoT’s automation adjusts settings without the need to deal with busy building maintenance. Smart technology that improves energy efficiency and functionality is increasingly in demand. The numbers game is changing how real estate professionals conduct business. Smart dashboards and analytics are driving the sales process by helping professionals target the right consumers and grow their revenue. Every aspect of the sales process can be turned in measurable data points. From smarter CRM experiences to more automated processes and reports, Big Data will continue to improve the real estate industry. 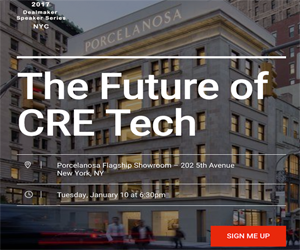 All of these CRE tech trends are aimed at helping real estate professionals better service their customers, whether through security or facility function. Pay attention to their development throughout 2017.